I just bought my first box of cereal in a while. At the grocery store, an entire side of an aisle was completely filled with cold cereal – every brand and flavor and shape and color you could imagine. Very nice variety for a common breakfast food and afternoon snack – a lot more than I remember. I really wish I could see some data on which cereals do best for which age groups, during which months of the year, and purchased at what time of day. It’d be interesting to compare marketing campaigns too. Does anyone buy the big box of Kelloggs Smacks cereal? I didn’t think so. Anyways, all this got me thinking… what are the qualities of a good cereal? 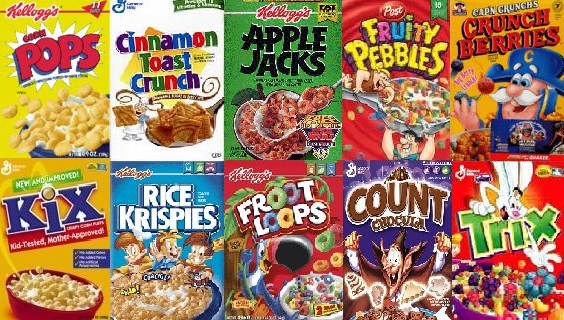 Would the output of a cereal ranking algorithm be similar to my instinctive ranking of cereals? Let’s find out. Scores were summed up across all parameters. The cereals were then sorted from lowest score to highest score to retrieve the final ranking of cereals. As a note, the ‘Good w/ Fruit’ and ‘Needs Sugar’ fields were weighted slightly lower than the other three by simply giving them a lower maximum score of 2 versus a 3. You’ll also notice no column for ‘Flavor’. It’s too hard for me to score based on flavor as that is pretty mood-dependent, and hopefully that information is covered by the other columns anyways. Note: Lower score is better. The results are interesting, but still expected. You’ll notice that the fun and texture of the fruity cereals clusters them in the middle, dragged down by their lack of healthiness. Only a few cereals really get to the top of the list, and I’m delighted to see Crispix and Honey Bunches of Oats up there (and next to Cinnamon Toast Crunch which is probably the best flavor). With some cut banana and/or berries, those first two are the most satisfying cereals, down to drinking the last drop of milk. Finally, we see the hot cereals in the middle of the pack as well, high on health but low on fun and texture. I acknowledge that this list is not comprehensive. For example, it has been pointed out to me that I am missing Raisin Bran Crunch which is a pretty popular cereal of choice these days. I also forgot Clusters / Honey Nut Clusters which I was huge on for a while as a kid. Whoops! I also acknowledge there is some bias built into this scoring, as what I believe is “fun” or “good texture” is different from what you will think is “fun” or “good texture”. However, it’s a quick algorithm that you could apply to anything to help understand not only the elements being measured but also about the person doing the measuring. Oh, and if you were wondering, I bought Honey Bunches of Oats. Real life: Crispix rocks as all around best next to Life, but Frosted Mini wheats is the most healthy replacement for ice cream for evening snack. TRIX IS BAD!!!!! !guess who! hah! this has to be………. kristen! ?TRIX IS THE BEST!!!!! Per your request, I will share my comments on your post with the blogosphere. Honey Nut Cheerios are the best b/c they are healthy, fun, have good texture and and great with fruit. Your study is seriously skewed I CAN'T BELIEVE YOU DIDN'T INCLUDE THEM!!!! !